SC FIRESHOW is a company whose main activity is importation of fireworks directly from the manufacturer and selling them in bulk regime and retail. The company has a range of over 450 pyrotechnics and it is also authorized to execute the fireworks. 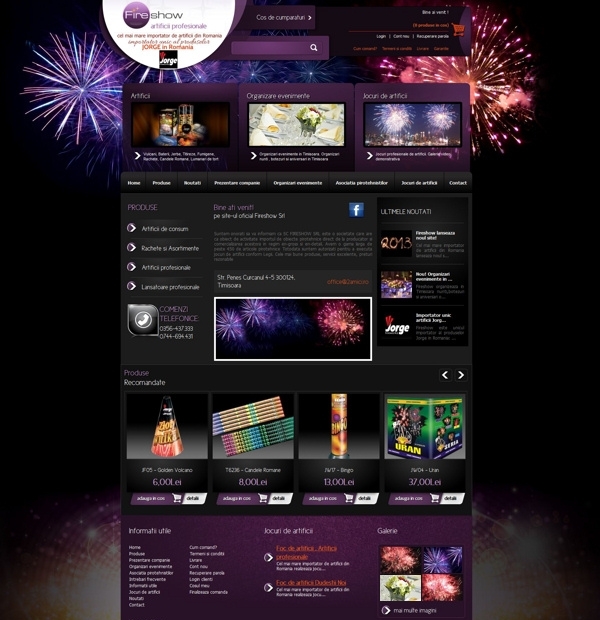 Fireshow, the largest importer of fireworks in Romania, has chosen to work with our web design agency for achieving new presentation website and online store. Customized e-commerce solution has been programmed from scratch according to customer needs using modern technologies. Our company does not use templates or open source solutions but guarantees to create a unique online store. - Import-export situation of stocks, products, categories, list of customers, orders etc.